Our first post From Berlin-London-Copenhagen-Kyiv (FromBLCK) is about baking. Happy baking, that is: easy, with relatively little mess in your kitchen afterwards, something that tastes amazing, makes the whole place smell like heaven, and of course helps you relax and forget about all your troubles. I've never really been into baking, until last winter when i was studying for my (tough!) Danish exams. Stressed out and anxious, i somehow came across a fairly easy recipe of the carrot cupcakes during my study break. As it turned out, baking can do wonders to your stress level and in my case massively reduce the anxiety. I was so much 'in the flow', that i forgot all about the PD3 (Proeve i dansk 3..), plus the end result was so delicious, i couldn't believe i actually made it myself. Many months later, i'm still doing baking for dummies, slowly building my confidence in the kitchen and trying various not-uber-sophisticated recipes. I'm so much into it now that i started baking on a weekly basis. 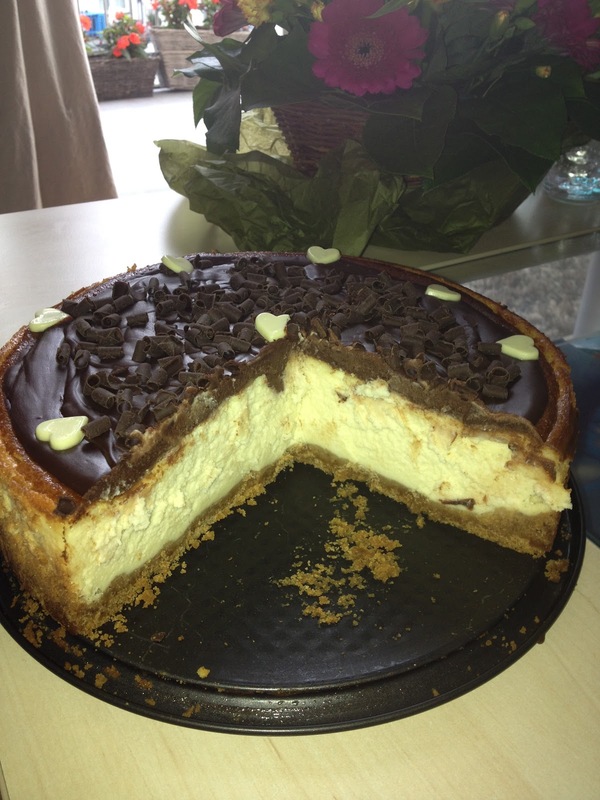 My all-times favorite dessert is a cheese-cake. of any kind. and i would love to share this simple winning recipe with all the devotees of a good cheese-cake. The recipe i used for the crust and filling of this particular cheese-cake, is from here. I used Digestives instead of graham crackers, and less sugar for the crust. Didn't get to use that large roasting pan with water in the oven, and simply baked it in a springform for 50 min. Important! once the cheese-cake is baked, do not open oven door, just turn the oven off, and let the cake cool in oven with the door closed for 5 to 6 hours; this prevents cracking. - 150-180 g of any high quality couverture chocolate 60-65% cocoa (Valrhona Le Noir 61% puissant et chocolate is the best one i've tried sofar: it is quite pricey in Denmark, so if you find it - much cheaper - in Berlin and London, do stock up on those massive 1 kg bars!). Keep the cheesecake refrigerated. It always tastes better if made 1 day in advance. Enjoy and please do share the best, well-tried recipes of your favourite kind of a cheese-cake.